It’s the TBB Intern Lemur, here to answer your questions and do what I can to give you some insight into LEGO, the fan community and TBB! Give me a minute to catch my breath. I’ve been cleaning the bottom of the pool here in the TBB compound. It’s way easier to do when they let me drain it, but Carter was getting in his laps and Caylin said it needed cleaned immediately. They don’t call her the ‘Goddess’ for nothing! When she says “jump”, you jump. Even if it’s into the deep end. She was right though. It did need cleaning. The weekend pool parties get kind of nuts around here. I’m mostly done, except I’m not sure how to get Iain’s boat up off the bottom. Oh, that reminds me. I was right about last week. I got a serious talking-to about mentioning a certain other person’s personal water-craft. Won’t make that mistake again. Anyway, I’m taking a break now, down in Ralph’s basement lab. He doesn’t take much notice of me so the lab is a good place to get away for awhile. Especially when I’m trying to answer your questions. There are some scary things going on down here, but I just pull a blanket over my head and try not to listen to the maniacal laughter. It’s all good, as long as you don’t taste anything while you are down here. That was another mistake I won’t make again. So, on to your questions. Boy, there were some good ones this week! What are illegal building techniques? [Why] are they illegal? This is a great question and one that I was confused about for some time. When I first started building, I had heard of illegal techniques and I was afraid I’d be deported back to Madagascar if anyone caught me using them. Fortunately, they are nothing like that. The simple answer is that illegal techniques are those techniques that LEGO designers are not allowed to have in an official LEGO set. They change over the years, but tend to fall into two categories. The first is any technique that stresses the pieces or elements. One example is bending technic beams. You can build some good minifig launchers simply by putting a little stress on a technic beam and then letting go. Not that I have ever done that or recommend it. However, putting stress on an element will cause it to break eventually, so designers aren’t allowed to do that in a set. The other category is in regards to safety. Many LEGO sets have some sort of firing mechanism. There are tests to determine how hard they can fire and what sorts of projectiles are allowed. One such test I read about was to fire a projectile at a stretched piece of plastic wrap. If the plastic wrap was damaged in anyway, then the mechanism was too powerful or the projectile too sharp. I’m sure there are variations on these categories. What you really need to remember is that the term “illegal techniques” only applies to LEGO builders and designers. If you don’t work for LEGO, you don’t need to worry about it. The LEGO police are not coming after you…yet. What exactly are brickcons, and are they different from comiccons? I believe people post photos of MOCs from both. Another good question! First we need to make one thing clear before we move on. There are many LEGO fan conventions all over the world. Way too many to list here. I would definitely forget to list one and then they would be mad and send hate mail. Then I would have to hide in a closet until the protesters went away. Nannan has assured me that they can’t breach the walls of the TBB compound but you never know. I don’t want to tempt fate. Anyway, only one of the fan conventions is called “BrickCon”. It is held annually, in Seattle, and is not a generic term for all LEGO fan conventions. On the other hand, “Comic Con” is a generic term for Comic Book/Pop Culture conventions. They also have specific names (such as San Diego Comic-Con) but Comic Con isn’t a reference for one specific convention. Does that make sense? How are LEGO fan conventions different from Comic Cons? LEGO conventions are for LEGO only, for the most part. The only displays are of LEGO creations (MOCs, if you remember from last week). The seminars, panels and such are LEGO-related. There is nothing but LEGO…not that you need anything else, of course. Comic Cons, on the other hand, have evolved from strictly Comic Book Conventions into what are basically Pop Culture Conventions. But saying “PopCulCon” doesn’t have quite the ring to it that “ComicCon” does. Comic Cons have all sorts of crazy things going on, including LEGO displays. So far there are very few Lemur-related events at Comic Cons. I’m hoping that changes soon because it gets old when people assume I’m human child cosplaying as a lemur. I am wondering what I can do to help feed [my son’s] interest? I take him to Lego conventions to see the displays, but he’s too young to register. Are there online communities for kids, magazines, etc. I should know about? Thank you! There are many different LEGO fan sites but most don’t allow members under 13 years old, due to legal regulations. LEGO itself has The LEGO Club, which has a magazine, online activities and other online interactions which are designed for kids and their safety. There is also BrickJournal which, while aimed towards an adult readership, would provide inspiration. Josh’s kids steal his issues of BrickJournal all the time. Thank you all for your questions! Those that wrote these questions will be receiving an email later this week, so that I can send them some TBB loot. Remember to make sure your email address in your profile is correct! An email was sent off last week and no one ever replied. Either the email address was out-dated or the person just didn’t want some free stuff. Don’t be one of “those”. 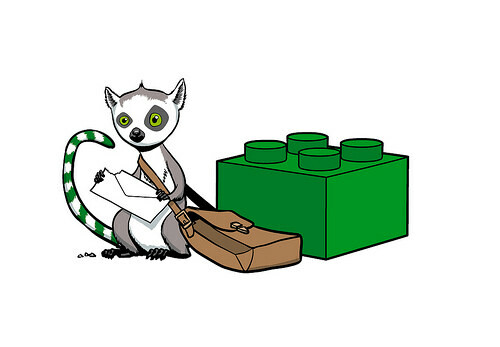 Keeping building, be creative and remember, lemurs care! I did not reply to your email because i did not recieve one :P my profiles email is uptodate, however i accidently subscribed to be notifyed to every new post on the bb, resulting in me being spammed. Please do not be insulted by my lack of response, some free lego loot would be awesome!! Um, what? I think Zach meant to post somewhere else? Anyway. On to the topic at hand. Good info, Mr. Lemur! You did however skirt almost entirely the spirit of the question regarding ‘illegal building techniques’. I am certain the question came from someone who had heard this phrase uttered in regard to someone’s MOC and not LEGO building and design terms and conditions. Clever Lemur! No one likes to admit they admire a build that uses extensive let alone one or two ‘illegal’ building techniques and since the bb posts such builds almost daily why muddy the waters with the REAL conditions necessary to deem a build somewhat ‘illegally’ conceived and executed. Simply put, most people use the phrase ‘illegal building technique’ to refer to any use of LEGO bricks other than the intended clutch connection. For example, most cheese wedge mosaics. They are still fine MOC’s but the ‘purists’ (among whom I would probably be included simply because I don’t use non clutch building connections) would say such builds are fun to look at but in the end don’t pass the legitimate test. Incidentally, many of use deem pouring brick into a container to represent such textures as lava and water, while perhaps not technically illegal, most definitely lazy. What is the best way to get Lego for cheap? I was trying to get parts from the online pic a brick but they are so expensive! Any tips Mr. Lemur? I’ve seen a lot of weird acronyms used by Lego fan’s, such as SNOT, BURP, and NPU. Is there a way to find out what these mean? What is your favorite online LEGO building contest? Hi Mr. Lemur!! Big Fan. Now, I was wondering something, I hope you can answer (and send me freebies! ): What are LUGs? I live in Maine, is there one for my state? What do they do? Another class of illegal connections that the designers at LEGO have to consider are ones that would simply be too difficult for younger builders to reliably carry out. Or connections that are potentially imprecise, such as “pony ears” (jamming a plate vertically between the studs of a brick). You can see examples of pony ear technique in older LEGO sets, but it became “outlawed” some years ago, and thus does not appear in newer sets. I’ll punish the lemur for this oversight, just as soon as Amazon starts stocking thumb screws in child sizes. I have a question… What are these free gifts TBB sends to readers and what exactly are they? @Deus – It’s whatever LEGO-related stuff that the Lemur comes up with. Currently he has a stash of The Brothers Brick bricks and pins. He is giving stuff to the people whose questions he chooses to answer. That may change at any time. The lemur can be fickle. Hope you are doing well. Just wondering exactly what LUGs are and what they do… Are they similar to groups at LEGO conventions like BrickCon and Bricks by the Bay? I know it means LEGOUsersGroup, but the name is a tad vague… Could you enlighten? Thanks! Also, is there a good LEGO digital rendering program you would recommend for Macs? LDD is not very good for rendering, and some other programs are only for Windows. Yes, I can run parallels to Windows on my Mac, but it can be a bit of a hassle, do you recommend any programs that work on Macs? Can you tell us more about how you select BB bloggers? I like your Q&A. Have a great holiday! Q: I often see non-AFOLs lamenting that current Lego sets “have too many specialized pieces” etc. Can you point me to a resource that debunks this? I am positive I have seen it somewhere -a nice breakdown of how many different elements were available over the years and it shows that recent sets do not, in fact, have more specialized pieces than any but the very earliest sets. Q: Have you seen any red jumper plates? I’ve got dibs if you see one. I’ve checked the corners of this old suitcase where all the small parts tend to end up but haven’t seen one. Yes, if I see the other black horsey I’ll give it to you. No, I’m building a spaceship and I’m not giving you any of my hinges. Go ahead, tell mom, I don’t care, I found them first. Not so much a question, as a neighbourly heads up: did anyone ever bother to check that that basement is properly aerated? Given the extensive amount of nitrous oxide I noticed gets delivered on a weekly basis to your compound (along with regular BrickArms shipments; what’s up with that? ), it would certainly explain Ralph’s “maniacal laughter”. When are you going to get your own contact information on the site’s “Contact Us” page or a mailbag link on the top navigation banner?